Amos Miller is very excited about this new product! Miller's Organic Farm now has their own camels on the farm! Mama and baby are happy and producing plenty of milk. The camels eat organic (chemical free) grass most the year, or dry hay in the winter (chemical free transition hay). The milk is never heated. Camel milk is very easy to digest and has a mild slight vanilla flavor. It is purchased often by parents with autistic kids who have a hard time digesting casein. It has also been used as a replacement for infant formula for infants who do not tolerate cow or goat milk based formula. Positive effect on helping breast cancer patients (Eiseler et al., 1998). Three times the amount of vitamin C than cow's milk. Used for centuries to treat liver disease (studies performed for hepatitis and liver cancer with promising results). Rich in B vitamins and iron. 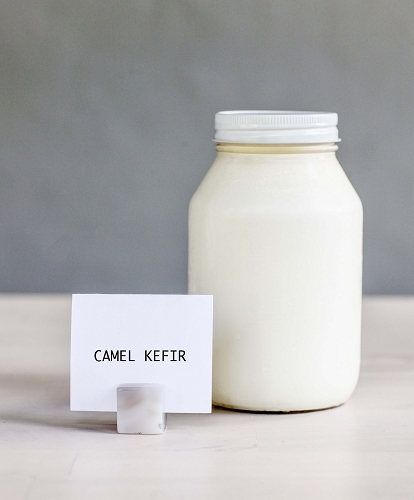 The immunoglobulins in camel milk are protect against certain types of cancer (Fage et al., 2005).